Houses do not become homes overnight. A house will be bare and gutted until a family moves in and makes it their home. 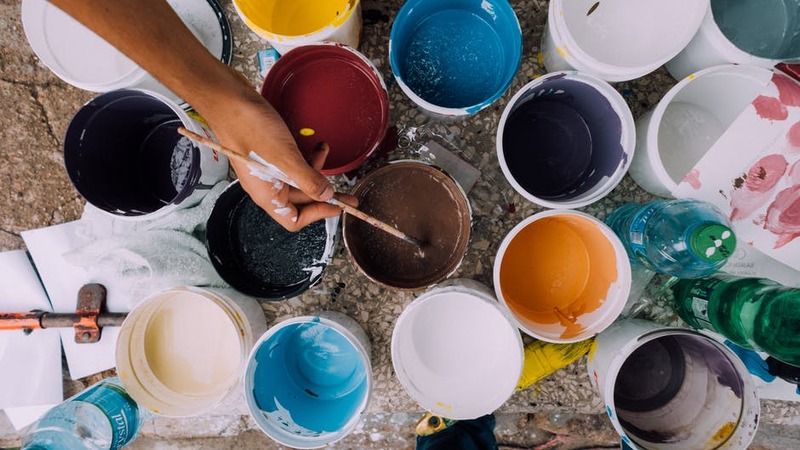 If you have just moved into a new house, and you are looking for a few paint based DIY projects to make your new house feel like a home, look no further. With a few easy tips and tricks, you can easily add touches of warmth and creativity to your house to make it feel cozy like a home should feel. Bedroom furniture often looks plain and simple because no one typically sees the bedroom except for the ones sleeping in that room. You shouldn’t skip out on a cozy bedroom, however, just because no one sees it. A quick headboard project could include painting a few old doors or painting large frames. Switch up the paint color, and your living space is instantly brightened. You can easily make your bedroom look entirely different just by creating an interesting headboard. There many great DIY home décor ideas that can offer many interesting headboard designs. Everyone loves having beautiful pieces of artwork on their walls. These pieces bring a sense of light and inviting atmosphere that homeowners want their guests to enjoy. You can easily buy large pieces of artwork, but they can become expensive. Instead, you could make several DIY wall art pieces to hang in your new house. You can use stencils to paint large meaningful quotes on your walls to create a warm atmosphere. You can also buy a large canvas and have your children paint random things on the canvas for a more personal DIY touch. Your front door is the first thing that guests see when they are welcomed into your home. Making that door a fun bright color will make a statement to the whole neighborhood and instantly bring your home to life! Popular color choices are red, green, yellow, and blue. These pops of colors will help make your home stand out and feel like it is uniquely yours. Photographs are the quickest way to turn your house into a home because photographs are so personal. There are also many ways you can display photos in your home, but perhaps the most interesting way to display them is on a canvas. You can have your personal photos printed only large canvases with a painted wooden frames, but this is becoming more of the normal style. If you want something a little unique, try transferring your photos to a wooden block. Many resources give step by step instructions for those who want to DIY transfer photos to wood, which you might find is surprisingly easy. You can also easily had a painted border to give it more of a personal artsy flair. If you are low on storage space in your home, the quickest way to bring warmth and have storage in your room is to add shelving. Of course, you can buy pre-made shelves to hang in your home, but these often look clunky. You can always make these look better, or elevate your current shelving with a quick coat of paint in your favorite color. This can transform something from function to fashion. For a bit of quick DIY, you can take a few older pieces of wood, add some bolts and a fun coat of paint, and hang on your wall. You house is simply a house until you can make it your home. Whether this is your forever home, or you are planning on selling it for sale by owner, there are ways you can make your house feel like a home. Decorations and paint are the fastest way to create a cozy home. You could easily buy pre-made pieces of furniture and artwork, but you could also DIY to make your home custom and personal. It’s easy to find simple DIY projects to decorate your house to make it cozier. With a few tricks, you could have your house feeling more like a home in no time. Whatever your tastes are, you can be sure to find many DIY projects that are a great fit for you and your home.